Lizzies Plads (Lizzies Square) is the result of a very active and enthusiastic chairwoman from a local residents’ association in Copenhagen. Her name is Lizzie, hence the name of the square. Before she stepped up and took action, it was just a sad space without a name, used as a dog toilet and a place where people carelessly threw their garbage. With funding from the local committee, the square was transformed from more or less a dump into a little pocket of light and beauty. Now surrounded by trees, this former non-space is populated by the sculptures of a violinist and an accordion player providing music for a forever dancing couple also carved in stone. The scene is illuminated by a huge chandelier of twelve lamps symbolizing the twelve months of the year, with the colour of the light changes depending on the season. 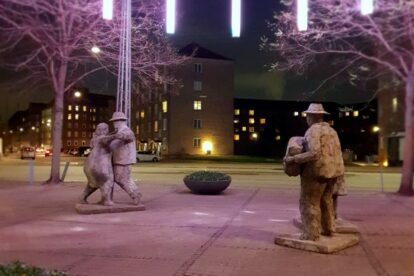 The artist behind the sculptures is Knud Ross Sørensens and the chandelier is designed by architect Lasse Schelde. The square is a pretty sight any time of the year, but especially here in autumn and winter where the days are short and darkness falls early.